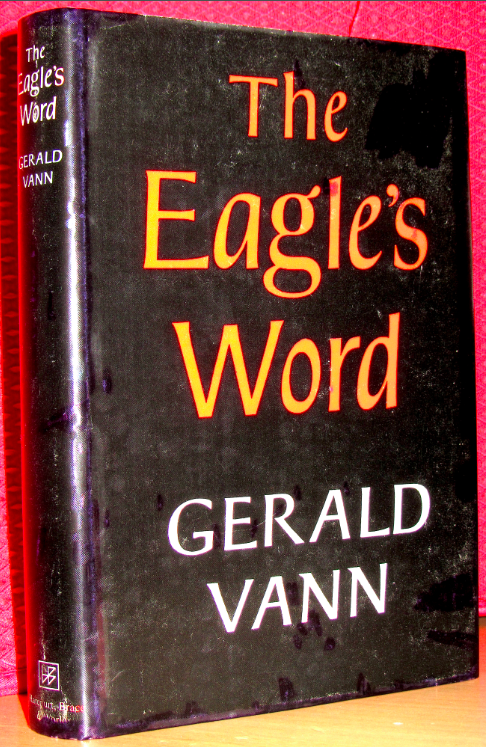 Click here for sample verses from the version by Gerald Vann. Date: ⓒ 1961 by Gerald Vann, O.P. Contents: The Gospel of John. – Introduction; Notes on the text. Comments: Clothboard octavo with DJ; sewn binding; 248 pp. Scripture text in single column; direct speech and poetic parts in colometric print. Chapter headings but no versification; no extras; page numbers in footnotes refer to the commenting in the introduction. The necessary information about the Gospel‘s references to the Old Testament, together with word studies, are also found within the essay. – The story of the woman, “caught in adultery“, is placed at the end of ch. 8. 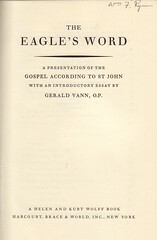 This title was also available in two volumes: vol 1 presenting the Introduction, vol. 2 the Translation. The data in the impressum of the 2-vol ed. are identical to those in the one–volume edition. 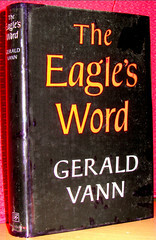 – This title was originally published 1961 in London, England, by Collins. It was also translated into German, under the title »Wort des Adlers« (Innsbruck, Tyrol: Tyrolia- Verlag 1965), but – unfortunately – without the Word of the Gospel (commentary only). 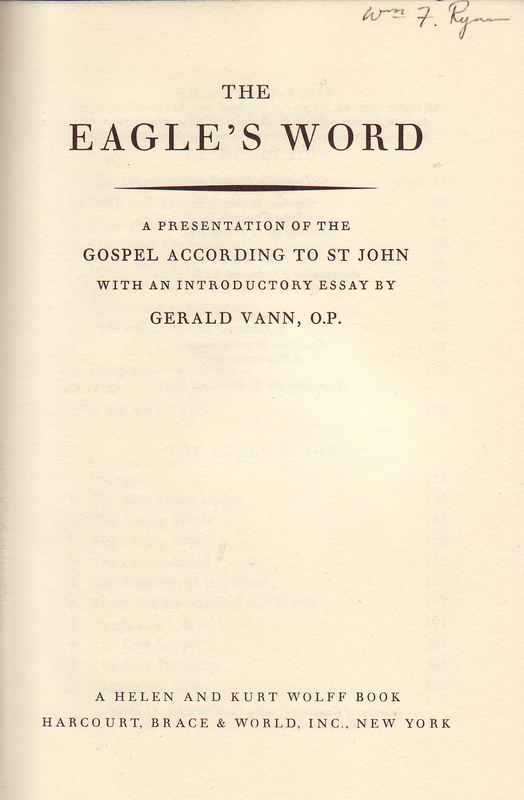 John the Evangelist / Apostle is symbolically portrayed as an EAGLE – hence the title of the book – because if the lofty, soaring beginning of his Gospel. He transcends the things of earth and of time, and speaks of the divine nature of Christ. Born at St Mary's Cray in Kent (England) on 24 August 1906, he was taken as a baby by his mother to Woodchester, where she had been brought up, to be offered to God according to his will. He was educated in the apostolic school at Hawkesyard and received the habit at Woodchester at the age of seventeen and made his profession on 30 September 1924. He began his studies at Hawkesyard and then was a member of the original community at Oxford, being ordained priest on 11 June 1929, three weeks after the reopening of Oxford as a priory. After obtaining his lectorate at the Angelicum in Rome he read English at Oxford and obtained a first class honours degree in 1934. For the next eighteen years he taught at Laxton and was headmaster from 1948 to 1952. Thereafter he was assigned to Cambridge, Edinburgh and finally Newcastle, where after a long illness during which he was nursed with love and care by the brethren he died on 14 July 1963, aged 56, with 38 years of profession and 34 of priesthood. The panegyric preached at his funeral by Fr. Sebastian Bullough OP was published the same year. His difficulties in life were a source of great sympathy for those suffering or in trouble of any kind; he was enormously hardworking and while a schoolmaster had also been engaged in lecturing, broadcasting and writing; and he had traveled to America where he had a great reputation and where his books were still being republished thirty years after his death.